I know I've already got a thread here for Nicola Roberts, but this is something a little bit special so I decided to start a new thread. A while ago while chatting to eJm I asked him if there were any particular things her would like to see Nicola lift (as I'd found a couple of good source pictures for her) he mentioned that he did have a couple of suggestions but they were all much heavier than my 'normal' weight limit (about 200 tons). After some consideration I decided to go ahead and make a picture featuring Nicola lifting the Statue of Liberty (one of his suggestions) as a favour for him. I posted the final picture on deviantart and a few months ago someone said they'd like to see a follow up picture of Nicola lifting something even heavier, so I decided to have a crack at making a picture of her lifting a mountain. I've decided to post both photos here, so that people on this board can enjoy them. So, without any further delay, here are the photos, I hope you like them. “I’ve found out that the longer my hair grows the stronger I become. Right now I’m strong enough to lift Statue of Liberty with ONE FINGER, and of course the stronger I become the harder my hair becomes to cut. Soon I’ll be the only thing powerful enough to break it, then nothing will stop me getting stronger and stronger!" As time wore on Nicola Roberts found herself continuing to grow stronger and stronger. After a while she discovered that even cutting (well tearing) her hair made no difference to her strength. She had already gone from lifting tanks and trains to buildings and ships, but her as strength contained to increase she found it more and more difficulty finding anything to change her. Eventually even the largest of buildings felt light, so Nicola realised that to get a proper workout she would have to try something else. Mount Fuji towered over northern Japan, one of the most famous mountains in the world and at 3,776m one of the highest as well. The volcano had reminded dormant for decades, and few of the people living in its shadow game any though to the risks, until one day when a sudden explosion shook the mountain to its base and raised a massive cloud of dust from its side. Few of the surrounding populations had noticed a bright streak in the sky, and none of them would have realised that is was a superpowered British pop star Nicola Roberts. Despairing of finding any manmade objects to test her strength against she had decided to try the more than six billion tones of Mount Fuji. Nicola drove her way through the solid rock with ease, within a few seconds she was inside the volcanic heart of the mountain. Unaffected by the tremendous heat and pressure Nicola pressed on, using her powerful breath to cool the magma as she passed through it. Finally, after less than 5 minutes Nicola had finished her work and was ready, deep inside the mountain surrounded by billions of tones of solid rock. She carefully positioned herself at the very centre of the mountain and fired several blast of heat vision to weaken the surrounding rock, then pressed her hands upwards and began to push. There was a deafening sound of cracking and splintering as the mountain started to move. The ground shook and those nearby ran for safety fearing another earthquake. The shaking and cracking continued as Nicola kept pushing upwards slowly tearing Mount Fuji from the surrounding landscape. For the first time in quite a while Nicola was having to serious exert herself, but the weight still felt manageable. As she pressed her hands higher and higher rays of light started to filter in though the cracks in the rock, proving that she was indeed lifting the entire mountain. Eventually Nicola had reached as high as she could and locked her arms , before beginning to push upwards with her flight power. The effort required increased dramatically as Nicola was now supporting the over 6 billion tonnes of rock on nothing but thin air, but it still do not feel overwhelming. Slowly Nicola began to rise into the air, and gradually the sound of grinding rock subsided as Mount Fuji was finally torn completely from the ground. The people nearby stared in amazement as the gigantic mountain rose into the air and hung there, seemingly without any means of support. None of them could make out in minuscule shape of Nicola at the very centre of the mass, and few of them would believe that a small woman could lift such a gigantic mass. Although to the observers the mountain appeared stationary it was in fact moving almost imperceptibly up and down as Nicola, having reached a height she was happy with, began overhead pressing the incredible weight. 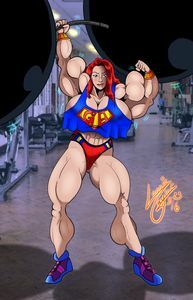 However as she continued Nicola became increasingly disappointed, despite the massive weight she was lifting it was only just enough to give her a good workout, and nowhere near her limit. After a few minutes Nicola became rather bored with her exercise and started to float slowly down, carefully manoeuvring the great mass of rock back into its original hole. As Mount Fuji settled back into place Nicola was left to wonder if there was anything left on earth that could truly test her strength, or whether she was going to have to try looking further afield to discover her limits. Last edit: 02 Sep 2012 19:38 by The Highlander. The sight of a massive ship being carried up a windswept beach by pop start and superwoman Nicola Roberts stunned the handful of people nearby, but wasn't nearly as much of a shock as she gave the Admiralty when she asked to borrow the brand new 8000 tonne HMS Defender. Incredibly, Nicola just wants to use the ship as an exercise weight, although given how easily she is carrying it she might have to start looking for something heavier!